This illustration shows the dual nature of light, which acts like both particles and waves. In a new experiment reported in November 2012, researchers observed light photons acting like both particles and waves simultaneously. Is light made of waves, or particles? This fundamental question has dogged scientists for decades, because light seems to be both. However, until now, experiments have revealed light to act either like a particle, or a wave, but never the two at once. Now, for the first time, a new type of experiment has shown light behaving like both a particle and a wave simultaneously, providing a new dimension to the quandary that could help reveal the true nature of light, and of the whole quantum world. Ultimately, there's good reason to think that light is both a particle and a wave. In fact, the same seems to be true of all subatomic particles, including electrons and quarks and even the recently discovered Higgs boson-like particle. 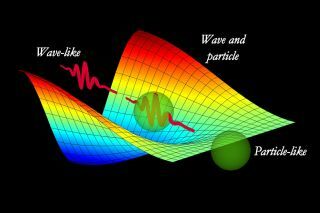 The idea is called wave-particle duality, and is a fundamental tenet of the theory of quantum mechanics. Depending on which type of experiment is used, light, or any other type of particle, will behave like a particle or like a wave. So far, both aspects of light's nature haven't been observed at the same time. But still, scientists have wondered, does light switch from being a particle to being a wave depending on the circumstance? Or is light always both a particle and a wave simultaneously? Artist’s impression, inspired by the work of the artist Maurits Cornelis Escher, of the continuous morphing between particle- and wave-like behaviour of light. Now, for the first time, researchers have devised a new type of measurement apparatus that can detect both particle and wave-like behavior at the same time. The device relies on a strange quantum effect called quantum nonlocality, a counter-intuitive notion that boils down to the idea that the same particle can exist in two locations at once. "The measurement apparatus detected strong nonlocality, which certified that the photon behaved simultaneously as a wave and a particle in our experiment," physicist Alberto Peruzzo of England's University of Bristol said in a statement. "This represents a strong refutation of models in which the photon is either a wave or a particle." Peruzzo is lead author of a paper describing the experiment published in the Nov. 2 issue of the journal Science. This story was provided by LiveScience, a sister site to SPACE.com. You can follow LiveScience senior writer Clara Moskowitz on Twitter @ClaraMoskowitz. For more science news, follow LiveScience on twitter @livescience.